The image above is from a 31 January 1920 Monroe County, Georgia census record. It shows the family of Lunnie L. Mosely, his wife Ruth, and widowed mother Mattie A. As much as we genealogists use, need, and treasure census records, it's amazing the information they DON'T reveal. For instance, can you tell from this document that Ruth is 6-7 months pregnant? I'd say not. So how do I know this? Clues were found in an obituary, of course! A few days ago I visited Midway Baptist Church Cemetery in Lizella, Bibb County, Georgia. It was my first visit to this fairly small church cemetery. Just from looking around at all the MOSELY headstones, it seems this burial ground could have once been on their family property. At the very least, they were prominent members of the church. After I returned home, I began looking a little deeper into some of the lives the tombstones stood for. When I came to Lunie Mosely's (1886-1920) stone, I was curious to know why he died so young. His death was just a few days shy of his 34th birthday. A simple search with first and last name didn't reveal much in my favorite newspaper database, GenealogyBank. I then went to Ancestry and found the census record mentioned above. The real find, though, was an obituary for Mrs. Annie Ruth Mosely Johnson. Unfortunately, Mrs. Johnson passed away about seven months ago. But her obituary helped put together the story of the death of Lunie Mosely who, as it turns out, was her father. Mrs. Johnson was born on Apr 23, 1920, in the Moran area of the county to Lunie Levane Mosely and Mamie Ruth Scott Mosely. Sadly, her father was killed by lightning when she was just two months old..."
Dies Instantly When Struck On Farm at Montpelier Springs. Brother Watches As Man and Animal Sought Shelter of Barn. Lightning that struck on the farm of Mrs. M. A. Mosely, at Montpelier Springs, on the Thomaston Road, at 4:30 o'clock yesterday afternoon, killed her youngest son, Lunnie L. Mosely. A mule that was standing close-by was killed by the same bolt. No other damage was done to the property, and so far as known this was the only place in Middle Georgia that was struck by lightning during yesterday's thunderstorm. Mr. Mosely was 32 years old, married and the father of one child, Annie Ruth. L. F. Mosely, his oldest brother, looked on yesterday afternoon as L. L. Mosely was struck down. He rushed up to his brother's side, and as he reached him the stricken man raised himself to a sitting posture and died in his brother's arms without being able to utter a word. L. F. Mosely brought the news of the death of his brother to this city last evening. He said that he was standing in the barn and that his brother had just come in from a field with the mule, seeking shelter. The storm was approaching at the time and as he was looking at his brother and the mule, just outside of the barn door there was a blinding flash. When he was able to see again his brother and the mule lay upon the ground. 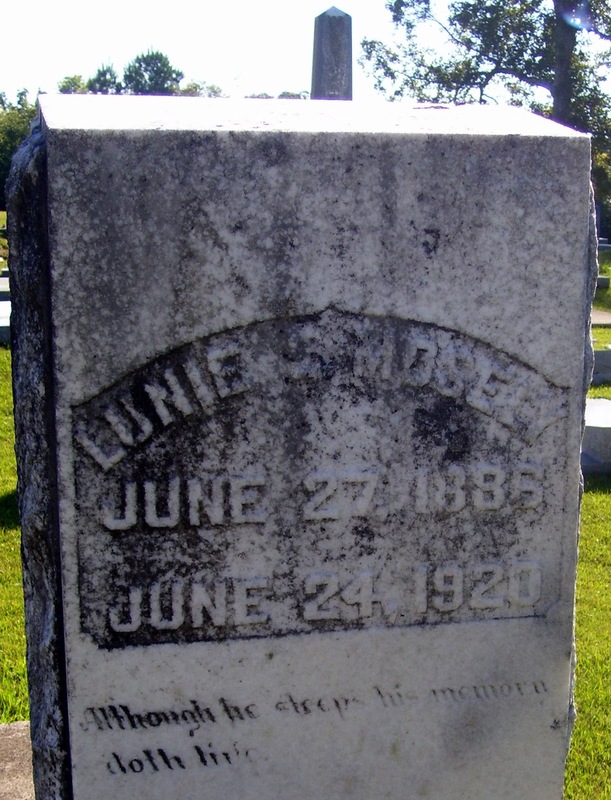 Besides his mother, wife and daughter, Lunnie L. Mosely is survived by five brothers and two sisters. L. F., J. L., L. J., L. G., and L. S. Mosely, and Mrs. L. C. Baultney, of Unadilla, and Mrs. L. P. Cosey, of Montpeliar Springs. The family is well known in Macon. The funeral will take place this afternoon at 4:30 o'clock at the family graveyard, Rev. H. H. Mosely, a member of the family officiating. An article about the funeral of L. L. Mosely published in the same newspaper a day later states his wife was the former Miss Ruth Scott. It further states Mr. Mosely was a member of the Baptist Church. The Midway Baptist Church Cemetery is located at 1200 Moseley Road with the cross street being Lower Thomaston Road. All the information gathered suggests I not only visited the final resting place for Mr. L. L. Mosely, but also the property of his family on which he breathed his last breath. The epitaph on Lunie Mosely's tombstone is, in part, Although he sleeps, his memory doth live. I would say this is still true, more than 90 years later.